The Honourable Sir Charles Kuen Kao, GBM, KBE, FRS, FREng (4 November 1933 – 23 September 2018) was a Chinese-born Hong Kong, American and British electrical engineer and physicist. He helped discover the development and use of fiber optics in telecommunications. 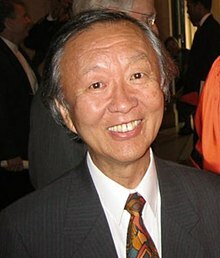 Kao was awarded the 2009 Nobel Prize in Physics for "groundbreaking achievements concerning the transmission of light in fibers for optical communication". Kao holds dual citizenship of the United Kingdom and the United States. Kao is known as the "Godfather of Broadband". Kao was diagnosed with Alzheimer's disease in 2002 and had speech difficulty. He died on 23 September 2018 from complications of the disease in Sha Tin, Hong Kong at the age of 84. ↑ Headline Daily (October 7, 2009). "高錕獲諾貝爾獎 國人驕傲". Headline Daily. Retrieved October 7, 2009. ↑ The Nobel Prize in Physics 2009. Nobel Foundation. October 6, 2009. Retrieved October 6, 2009. ↑ 8.0 8.1 Kelsey Mesher (October 15, 2009). "The legacy of Charles Kao". Mountain View Voice. Retrieved November 30, 2009. ↑ Chiu, Peace; Singh, Abhijit; Lam, Jeffie (23 September 2018). "Hong Kong mourns passing of Nobel Prize winner and father of fiber optics, Charles Kao, 84". South China Morning Post. Hong Kong. Retrieved 23 September 2018. This page was last changed on 23 September 2018, at 16:00.